Perform a preliminary disassembly and set the rifle aside. The buffer has a slot through which the spring guide sits. Compress the spring until the guide can be removed from the buffer. The bolt carrier guide rod and buffer can now be separated from the bolt carrier assembly as nothing holds them in place anymore. Turn the recoiling system around and push on the bolt guide pin. 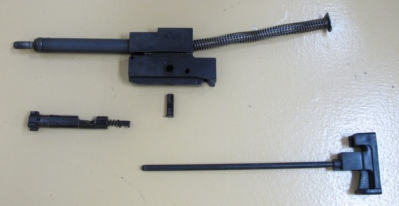 The bolt can now be pulled out of the bolt carrier assembly. 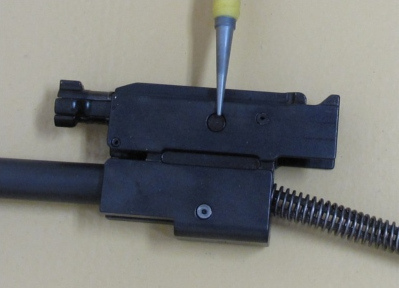 If you rotate the firing pin 180° it will come out with the bolt. 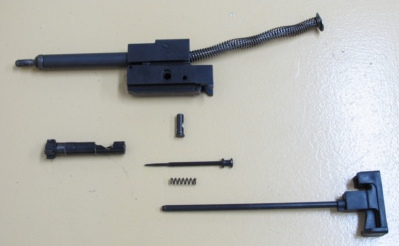 Otherwise, it will remain in the bolt carrier assembly and you can take it out the back. This is far as you should disassemble the recoiling system as an operator. 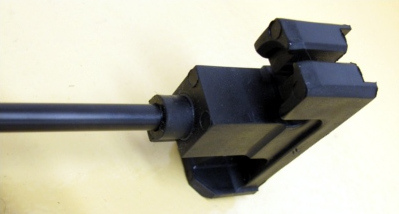 Note for the firing pin spring: initially the models sold in Canada did not include this spring. The effect was that some users were experiencing slam fires. To remedy this situation, IWI shipped a spring to all current owners. All new Tavors include this spring.